There's plenty of tablets out there already which run Android, today we have another one to add to the stable and if Arnova's previous efforts are anything to go by this will give you solid performance on a budget! 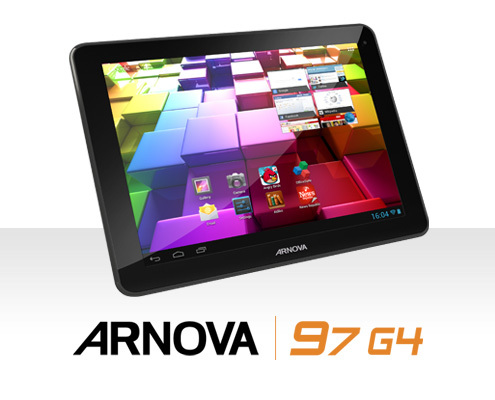 Today we've got another one of those devices and this time it's the Arnova 97 G4 and it seems like a pretty good device if the specs are anything to go by. With this device you'll bag yourself a solid 9.7" 1024 x 768p screen, which isn't too shabby in reality, it's not the best, but neither is it the worst. There's also Android 4.1 Jelly Bean running along on a dual-core processor clocked at 1.6GHz and a quad-core Mali 400 GPU. Other than that there's a full GB of RAM, 8GB of internal storage which is expandable with cards up to 32GB in size, which makes a relatively solid package. When you add in HDMI connectivity, a pair of cameras, one on each side and each 2 mega-pixel sensors this isn't a bad device, even if it is on the heavy side at 700g! For the moment we don't know anything about pricing or availability, but as we said at the start we can't see this tablet selling for more than £200 and perhaps it might be of interest to you! You can find full details at Arnova's page here!